A story appearing in the August 26, 2004 edition of the San Diego Union Tribune carried the headline “Flower Fields Manager to Join City Commission.” Michael Cardosa had been appointed to Carlsbad’s planning commission. In addition to listing his qualifications for the position, the article gave the names and occupations of the eight other candidates. Current city Councilmember Michael Schumacher was among them. Council members, Mark Packard, Michael Schumacher, and Keith Blackburn agreed with Hall. After an uncomfortable silence, each made it clear they saw nothing wrong with keeping constituents in the dark about the number and names of candidates for appointment or how the Council evaluates their applications. Beneficiaries all of the in-crowd network, Hall and the three other good old boys seemed annoyed to have their work questioned. At the following week’s meeting on May 16, Carlsbad resident Vickey Syage explained to them why their shadowy appointments needed fixing. Hall had been on the Council for six years at the time when he attended that 2004 meeting. 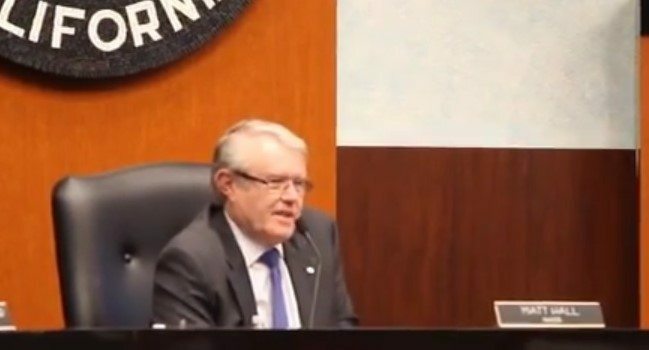 The transparency of decision-making under the leadership of Mayor Bud Lewis, compared to the secretiveness of commission appointments following Hall’s election as mayor in 2010, belies his selective memory. Thanks to a Facebook friend who prefers anonymity, my attention was called to council meetings where planning commission appointments were made under Hall’s leadership in apparent violation of city policy. Appointments to other committees and commissions are normally listed among the “Consensus” items on meeting agendas. They are grouped together with other items for a single vote for concurrence without discussion. A council member may ask that the mayor’s intended appointment be removed from the consensus column for a separate vote. If at least three council members vote against the mayor’s appointment, the candidate cannot be seated on the committee. But appointments to the Planning and the Historic Preservation commissions must be listed as separate agenda items, calling for nominations from council members, including the mayor. A majority vote produces the appointments. Shortly after Hall’s election as mayor, two appointments to fill vacancies on the planning commission appeared on the Council’s January 25, 2011 meeting agenda. “I put before you two names, Kerri Siekmann and Neil Black,” the mayor declared. After his implied motion was seconded he called for a vote without discussion or mention of any other candidates. The vote to approve his choices was unanimous. His call for a vote passed unanimously, once again with no discussion of other candidates. Schumacher abandoned his seat on the commission when he was elected to the City Council in 2014. At the council’s December 4, 2012 meeting Mayor Hall announced he would like to reappoint Marty Montgomery to the planning commission to fill a vacancy expiring in 2013. Montgomery had already served on the commission for two terms, a total of eight years. With no word of other candidates, Hall’s reappointment motion carried unanimously. Montgomery was reappointed a third time in 2015. If he serves out this term, he will have been on the commission for 12 of the last 15 years, uncontested by other candidates, thanks to the mayor’s patronage. One of the applicants, Brian Flock, a graduate of the city’s Citizen Academy, had complained about the lack of transparency and responsiveness to his application. Brewer began with a slap at Sacramento. For the first time since his election seven years ago, Mayor Hall was careful in his wording when he put forward the name of Velyn Anderson for reappointment to the commission. “That would be my first nomination,” he carefully announced. Cori Schumacher pointed out that two applications had arrived within the previous two days. Explaining there was no published deadline, she moved for a continuation of the meeting to a later date to allow time to review them. The good old boys sat silent. Her motion died for the lack of a second. Schumacher then asked to be allowed a second nomination. Hall cut her off. Overruling the mayor, the city attorney agreed with Schumacher that she was allowed to make a second nomination for the position. The two nominations would be voted on in order. Schumacher made her second nomination, Carolyn Luna, citing her qualifications. After Hall’s nominee won on a 4-1 vote. Schumacher re-nominated Luna for the second vacant position. Michael Schumacher countered with his nomination of Lisa Rodman, a high-profile champion of last year’s failed Measure A, which would have put a shopping mall on the shore of the Agua Hedionda Lagoon. Rodman has also been a former president of Carlsbad’s Hi-Noon Rotary Club. Rodman won the seat on an identical 4-1 vote. The other 8 applicants for the two positions remained anonymous. At the Council’s May 9 meeting, Hall explained how he reviews applications. Hall makes no mention of the applicant’s qualifications in education and experience. His review appears to be a search for fellow members of Carlsbad’s leadership in-crowd. Hall and Michael Schumacher are both former planning commissioners, while Councilmember Packard has been a member of Hi-Noon Rotary, a club requiring $1,200 in yearly dues and fees. Hall doesn’t need to see the names at the top of the applications to find out if a candidate is among his favored few. According to the city’s Web Page Information for Applicants, all applications are open for public inspection. Councilmember Packard’s claim that hiding the names of applicants saves them from embarrassment appears to be a cover for his fear he will be held accountable for his decisions. Revealing candidate names gives them the recognition they deserve to gain public support for later leadership opportunities. Like, for example, the recognition Michael Schumacher received in his transparently failing bid to be appointed to the planning commission in 2004. The good news is that three of the good old boys will be up for reelection next year. That, together with the adoption of district elections, means there’s hope for Carlsbad to abandon go-along-to-get-along politics, opening the door for “untapped leadership resources,” critical to stopping the transformation of this Village-By-The-Sea into a deep pocket developer’s dream. There just seems to be some inevitability about government’s tendency to brew unanimity tea and feed people the dregs. Bravo once again Richard for pointing out the hypocrisy and corruption that stalks 1200 CVD. Another prime example…how does Sage Naumann get a position on the Beach Preservation Committee??? Hall admits that he has never followed correct procedure by his statement that “this is the way we have done it for forty years”. By that admission he acknowledges incorrect process. Then he has the audacity to ask what is wrong with it? All four of the male council members had the same response. They needed an explanation as to why doing something that goes against a city policy directive is a problem. Are these gentlemen qualified to run a city when a third grader could understand the issue they are fuzzy on? No offense to third graders intended. When will Carlsbad wake up and replace the council with competent honest people? It was astonishing watching the reaction of the Mayor and the councilmen as Cori Schumacher answered their questions. Not one of them seemed to realize the association between hiring someone for the planning commission and hiring an employee. I wanted to scream, “There are H.R.laws you idiots.” They really like doing things THEIR way. They really dont like that Cori holds them accountable for the sake of the citizens. This made me think of when I first volunteered on the Sierra Club’s Election Committee, over 20 years ago. I had previously volunteered on several political campaigns, walking precincts and making phone calls, etc., but I realized I didn’t understand the process whereby appointments are made, and/or candidates are nominated, endorsed and supported for elected or appointed office, by political parties and elected officials. As a witness to this meeting, I was struck by the utter confusion that surrounded the nomination process on the part of Mayor Hall and his allies that evening. I’m still trying to discern who has the statutory authority to make appointments in Carlsbad. It was pretty obvious that the concept of “advise and consent” had never been tested until that night in City Hall. Though the process stunk, I had no issues with the reappointment of Ms. Anderson to the Commission. The fact that the application of Carolyn Luna was not even considered, is a tragedy for those who believe that these appointments should consider actual professional experience. The concept that divisive figures such as Lisa Rodman and Sage Naumann have any qualifications but fealty to the Hall and Packard junta, is laughable. As a small mercy , neither of the once and future candidates for office who applied were appointed. But of course there is always a next time, especially if you attend the right Rotary Meeting. The conflicts of interest of Hall and Packard are as deep as any in Carlsbad history. We feel they are morally and ethically choosing their own pocketbooks over their role as public servants for the citizens of Carlsbad. The only hope is that in 2018 enough Carlsbad citizens Wake Up! and vote for change! Their mishandling of Measure A brought all of this out in the open – it had been stewing for years behind closed doors… This will hopefully lead to positive change for the great city of Carlsbad! The lies behind Saving the Strawberry Fields certainly woke me up. I’ve gotten more gregarious, and ask people I meet if they live in Carlsbad. If so, I tell them that the mayor owns a city block, and is rezoning it so it is much more valuable, and has nothing to do with improving the village. Hopefully more people will get on board with this and spread the word.